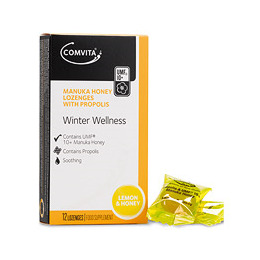 Comvita Manuka Honey Lemon & Honey Lozenges may help support and maintain a healthy immune system along with maintaining the health of the mouth and throat. Comvita Throat Lozenges are family favourites available in four great tasting varieties: Lemon and Honey, Coolmint, Menthol and Original (Aniseed). The lozenges combine the power of propolis with the effects of UMF Active Manuka Honey. Sugar, Corn sugar, UMF10+ Manuka Honey 1.06g (212mg per 1 lozenge, 4.7%) Water, Propolis solids 110mg (22mg per 1 lozenge), Lemon flavour (flavouring), Menthol, Peppermint Oil 11.5mg (2.3 per 1 lozenge). Dissolve one lozenge slowly in the mouth. Repeat, as required, up to five lozenges daily. Not to be given to children under 2 years of age. Do not exceed recommended intake. If swelling occurs of the mouth or throat, discontinue use. Do not use where there is a known allergy to honey. Allergy to bee stings does not prevent the use of this product. Below are reviews of Comvita Manuka Honey - Lemon & Honey - 12 Lozenges by bodykind customers. If you have tried this product we'd love to hear what you think so please leave a review. Excellent for sore throats and colds. Never without it. Comvita Manuka Honey Lemon & Honey Lozenges help maintain the health of the mouth and throat.